And if you miss the open enrollment period at the end of March, you'll have to wait until next November 15th to buy a qualifying policy. In the meantime, you would be responsible for all your healthcare costs. How will the government know you don't have healthcare? There's a new line on your tax return which you must sign, indicating whether you have coverage! The new government healthcare plans give a subsidy to those making up to 400 percent of the Federal poverty level (see chart below). But those who do not qualify for a subsidy are suddenly finding that even the most basic healthcare plans have increased their premiums dramatically to offset the potential costs of coverage for those who must be admitted, despite having potentially expensive pre-existing conditions. 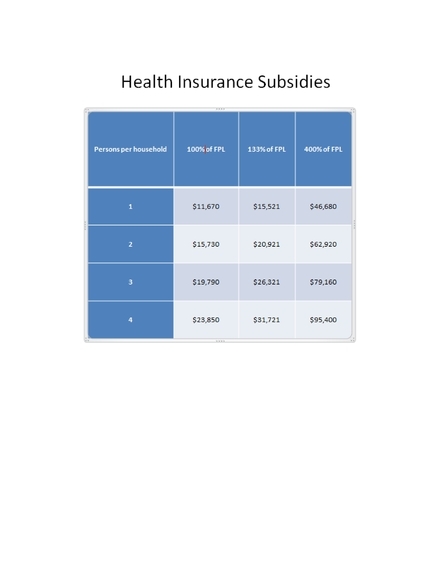 Here's a closer look at the subsidies, and then a few ideas for those who need insurance but earn too much to qualify for a subsidy. Health insurance subsidies are based on your modified adjusted gross income (MAGI). But your eligibility is not based on last year's income. Instead you must estimate this year's income. If you earn more than planned you may be required to pay back any subsidies. And if you earn less, you may be able to claim additional subsidies when you do your tax return in April, 2015. The dollar amount of the subsidy (paid directly from the government to your insurer) is based on a "benchmark" plan in your area. If you choose a more expensive gold or platinum-level plan, you do not get a larger subsidy. Individuals and families earning less than the income in the chart above are likely to qualify for Medicaid, depending on your state's program requirements. What if You Don't Qualify for a Subsidy? If you earn "too much" and don't qualify for a Federal subsidy, you might be in for a shock. Individual and family plans are suddenly far more expensive than just a year ago. A survey by eHealthInsurance shows that as of mid-February, 2014, the average premium for an individual cost $274 per month - a 39 percent increase from the average individual policy a year ago, before Obamacare went into effect. And family coverage has similarly increased. The average plan currently chosen by families who do not qualify for a subsidy because their income is above the subsidy limit is $658 per month - a 54 percent increase over the average family premium in February, 2013! What can you do if you are faced with buying insurance but don't qualify for a subsidy? •	Consider how you might lower your income in the year ahead, so you fall within the subsidy levels. For example, 40l(k) contributions are not considered part of your Modified Adjusted Gross Income (MAGI) -- although IRA contributions are, so if you increase the amount you put into your company 40l(k) plan it might get your MAGI below the subsidy level. Similarly, opening a Health Savings Account (with a qualifying insurance plan) might reduce your income that is counted toward subsidy eligibility. Even if you miss the March 31st deadline (which applies to all except those who have a "qualifying event" such as marriage or birth of a child), you should still think twice about going without any kind of coverage. Not only is the penalty expensive, but if you incur a medical emergency without coverage you are responsible for all the costs. Even a short-term plan would cover the worst-case scenarios and tide you over to the next open enrollment opportunity - November 15, 2014 through January 15, 2015, for coverage for the 2015 year. 1. You get insurance from your employer, and don't have to worry about this. 2. You qualify for Medicare, and you don't have to worry about this - except that you may lose your Medicare Advantage plan as the government takes away money from this subsidized inclusive option to fund Obamacare. 3. You have very little income and qualify for your state's Medicaid plan (and some states have lower threshholds than the lowest income level for federal subsidies). 4. You qualify for a subsidy, based on the income charted above, so you should go to the government site -- www.Healthcare.gov --and sign up for a plan immediately, and claim your subsidy. 5. You don't qualify for a subsidy but want/need health insurance, even at the most basic level for peace of mind and to avoid fines. Speak to an insurance agent or go to a private site like www.ehealthinsurance.com to find the best coverage you can afford at the least expense. It's a good idea for everyone to have health insurance. But don't make the mistake of believing that it will be less expensive for you under the healthcare reforms. That's only true if you fall into the subsidy income category. If not, insurance is going to take a big bite out of your budget. That's the Savage Truth.